EWG scientists reviewed Dr. Collins All White Bleaching Gel Syringe Refills, 10% Carbamide Peroxide for safety according to the methodology outlined in our Skin Deep Cosmetics Database. We assess the ingredients listed on the labels of personal care products based on data in toxicity and regulatory databases, government and health agency assessments and the open scientific literature. 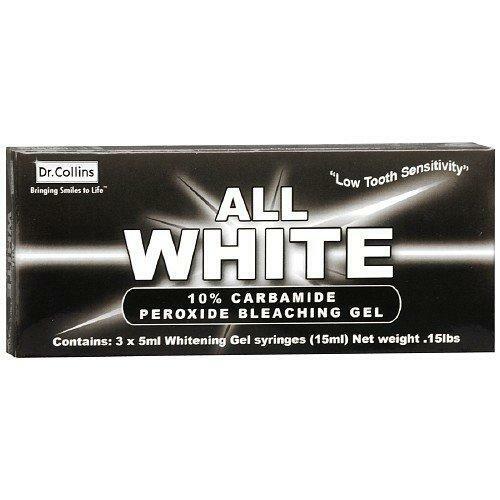 EWG's rating for Dr. Collins All White Bleaching Gel Syringe Refills, 10% Carbamide Peroxide is 2. Bleaching Gel is to be used only in a custom-made bleaching tray or a boil and bite tray. Load bleaching gel inside of tray and place over teeth to whiten. See insert for more details. WarningsTeeth whitening gel refills are ONLY used with Whitening Trays. Do NOT smoke, drink or eat while bleaching your teeth. It is NOT recommended to bleach your teeth if you're pregnant or nursing.